Foreign Minister Jorge Arreaza said “nothing will stop” the Venezuelan people from holding the presidential elections scheduled for late next month. 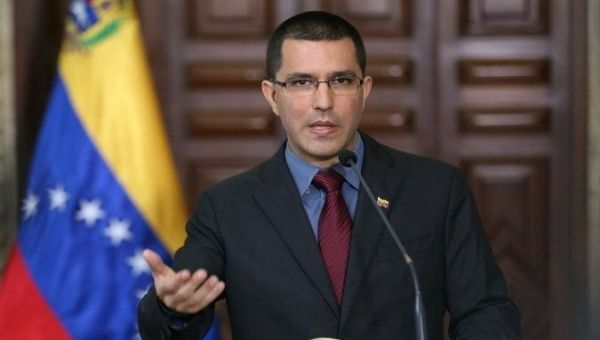 April 11 (teleSUR) Venezuela‘s Foreign Minister Jorge Arreaza says his country will go ahead with the presidential elections scheduled for May, despite foreign interference and the threat of further sanctions. Speaking at a press conference in Brussels, Belgium, Arreaza said: “The only ones who have to recognize the results in Venezuela are the Venezuelan people and the National Electoral Council (CNE). “We are not worried about if (U.S. President) Trumprecognizes it; if (Spanish Prime Minister Mariano) Rajoy recognizes it or if the European Union does not recognize it. Arreaza said the government had invited the High Representative of the European Union for Foreign Affairs and Security PolicyFederica Mogherini to “observe the Venezuelan electoral process. The observation means coming two days before, but if they want to come two weeks before, come; and if they want to leave two weeks after… because in the end, it is to be present to observe the auditing process. Recalling the threats Venezuela has faced courtesy of the U.S. government and other Western powers, Arreaza said: “(Former U.S. President) Obama issued a decree in 2015 qualifying Venezuela as an unusual and extraordinary threat. Despite the challenges, Arreaza said: “The Venezuelan people will prevail in spite of all the blockage… now President Trump is talking about an embargo, an oil embargo against Venezuela. “We will work with our allies. There is Russia, there is China, there is Turkey, and even some European countries that want to help us as well, so we are not afraid and nothing will stop us. Venezuela’s presidential elections are scheduled to take place on May 20.